At the stroke of midnight, the lights at the Selangor Club Padang (Dataran Merdeka) came on and ‘Tunku Abdul Rahman’ (centre), ‘Tun Tan Cheng Lock’ (left) and ‘Tun V.T. 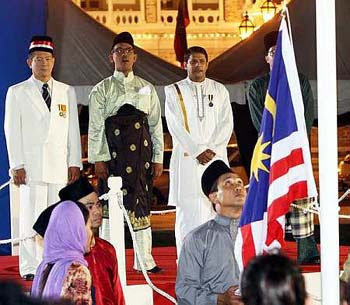 Sambanthan’ sang Negaraku as the Malayan flag was raised. Yesterday, the country's historic moment 50 years ago, was re-enacted for the filming of 1957 Hati Malaya. Some 300 cast members were in attendance for the film shoot, directed by Shuhaimi Baba. KUALA LUMPUR: “Tunku Abdul Rahman” was there, as were “Tun Tan Cheng Lock” and “Tun V.T. Sambanthan. It was just before midnight on Aug 30, 1957, as the leaders joined hundreds to witness the lowering of the Union Jack to mark the end of British rule in front of the Sultan Abdul Samad building. Last night, this historical moment in the birth of the nation was revisited for the cameras, with actors from award-winning director Shuhaimi Baba's 1957 Hati Malaya, playing the part of the iconic Malaysian leaders. Performing arts lecturer Mohamad Kamarulzaman Taib took on the role of Tunku. The Star's associate editor Kee Thuan Chye was Tan while actor G. Nadarajan played Sambanthan. Shuhaimi's movie is about the struggle for independence and relives the moments leading up to Aug 31, 1957 as the various leaders worked together to gain independence without bloodshed. Shuhaimi said that before making the movie, the public was interviewed as to whether they would be interested in watching such a movie. The response, she said, was negative. “To best capture the interest and imagination of young cinemagoers, we had to do a lot of research. We wanted to get them emotionally involved,” she told The Star in an exclusive interview. Kamarulzaman said his biggest challenge on the set was to “speak English and behave exactly like the Tunku.” Filming began in February and is due to wrap up in three days. The movie is expected to hit cinemas in September. I cannot wait to see you on the BIG SCREEN! This is something that I know you never planned but as they say, "God works in mysterious ways!" I am so HAPPY and PROUD that you accomplished this. You are setting an example for many young actors to follow esp. in ASWARA. Congratulations! For the icing on the cake - I hope the film becomes a BOX OFFICE success and you WIN MANY BEST SUPPORTING ACTOR AWARDS! !